I can’t paint all the time. I can’t afford to for one thing, but it’s not enough just to paint sometimes. I need to paint more then I don’t paint. And I can’t always do that which is frustrating. It’s not enough just to think about it either. Oh, you’ve got to do a lot of thinking, don’t get me wrong. Ideas bubble about in the creative soup for a long time, but it’s important, to do justice to your thoughts, to put the idea into practice. For only by doing will you learn. I see and I forget, I read and I remember, I do and I know. What kind of a name is Anselm anyway? Apparently, according to Katrin, studio assistant and native of Bavaria, the only other person in the whole of Germany called Anselm is one Pater Dr. Anselm Grün - a monk who writes improving books. Those with high resolution monitors may well be able to discern, tucked away in the top right hand corner of Anselm’s studio, below the aeroplane and behind the tomato plants, a forklift truck, or Gabelstapler as he might call it [or camion a fourche d’elevation as his rather long-winded neighbours would call it]. How cool is that? 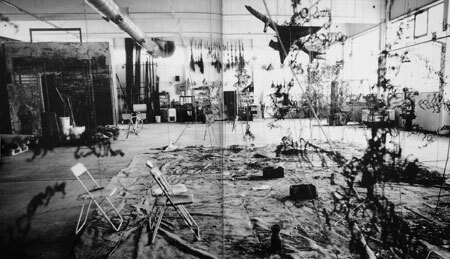 Mind you having a sodding great lead aeroplane, by Anselm Kiefer, hanging in your studio is pretty good for starters. 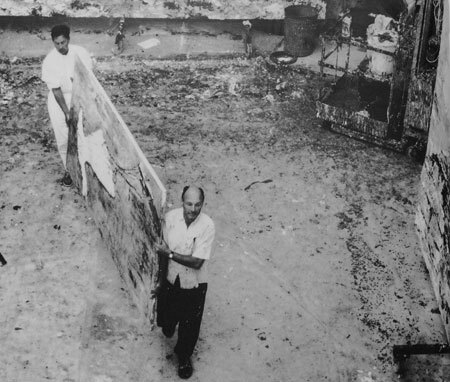 But then if you were Anselm Kiefer this might not have the same thrill. Clearly, when I get to have a forklift truck in my studio I’ll know I’ve made it. Or not, if it belongs to the bailiffs, obviously. You get it first time, but it’s shallow. Then you go again, another sitting, and you lose it. So you have to go again, and again, you have to fight for it. You fight and fight to get it back. It's a hard fought battle, but when eventually you get it back, it has depth. A history, a story, a struggle. Of course, sometimes you lose the battle, you don’t get it back, and it’s all opaque white primer from then on in. Such are the risks in this Oil Painting Industry. As I’ve mentioned before, an artist needs two people: one to inspire them, and one to take the work away when it’s finished. But it is important that the work moves out of the studio. You’ve got to give yourself permission. For only then will your work carry conviction and weight. Good or bad just simply doesn’t come into it. But trying to tie down what I feel is a hard nut to crack. It’s not like feeling cold, or feeling hungry. It’s like looking for the door in the dark: when you look straight at it you can’t see it. It’s an almost dream-like feeling; one of those dreams when you’re vaguely aware it’s a dream. My feelings seem always just out of reach, yet they have a profound effect on me. Sometimes the feeling is so powerful it’s hard to contain. I wistfully imagine that if I could just find the door I could do fantastic things. The greatest inspiration often comes when I’m away from the studio. Oh, the paintings I could paint on the 125 rolling back up the East Coast line. The figure in the supermarket queue is exquisite. The ideas come flooding in, the possibility seems endless. But when I get back to the studio it’s all gone. Whereditgo? I know it’s only because I can’t paint that I feel I can paint better than ever. And when confronted with the all too often terrifying reality of the paint - I find I can’t. Or to put it in its full paradoxical glory: when I can’t I feel I can and when I can I feel I can’t. Leonardo had difficulty finishing his pictures too, apparently, if we are to believe Desmond Olivier Dingle aka Patrick Barlow, in The National Theatre of Brent's Complete and Utter History of The Mona Lisa. The afternoon play on Radio 4, Thursday 16th June. A picture is never finished, I just stop working on it for a while. Then if someone buys it I stop working on it for really quite a long time. The finishing of a picture isn’t important. The painting is the thing, the pushing about of the oily stuff. It’s an exploration of emotions and observations. The exploration continues from panel to panel. The whole thing is not about making pictures for people to hang on their living room walls. Should someone want to hang them on their living room wall then so much the better. But for me it seems to be something I have to try and work out. It’s some huge puzzle, connected to everything. I don’t begin to understand what it is. There isn’t an answer. Do I do more? I can’t leave it - I’m not happy with all of it. I am happy with some of it. But if I’m not happy with all of it then I keep on going. Others come and coo and praise my work, and that’s good and encouraging and important; but no-one has looked at the painting for as long as I have. And when push comes to shove I’ve got to be happy with it. Which is kind of ironic because I’m never happy with the paintings. I am happy with the paintings – while I am actually painting it’s the best painting I’ve done. Then I sit and look and see where it can be better. This is what drives me to keep on painting. Grit or no grit - you just got to keep at it. Yes, there are tricks, yes, there is sleight of hand, yes, I pull some mean effects with contrast, but to get the person sitting in front of me, the animated face, fixed on the paper, requires something else. And I haven't a clue what it is. Sometimes it happens, sometimes it doesn't. Artists have been searching for The Golden Key for centuries, but it has always eluded them. I guess this is why computers are so crap at drawing. Sometimes you get that bit of grit in the end of the charcoal pencil which stops the marks flowing and everything becomes hard and scratchy. Embrace this, use the resulting broken line to help you find the form. Work the problem. Dwell in the incompleteness of the product, relish the choice now available to you. You have been thrust back into the days of uncertainty when the pen was dipped and the paper was not always the same thickness. Okay, so sometimes the whole shooting match comes to a halt with a bit of grit the size of Gibraltar. In this case resort to plan B: get in with the knife and carve out the offending lump to reveal the fresh black soft core of the thing. I don’t know what it is about Alizarin Crimson but it doesn’t always behave. Mostly it gives this deep rich warm red, ideal for that bit just as the form moves into deep shadow. [The deep shadow itself being the preserve of Indian Yellow cut with Ivory Black.] It is a belter of a colour with a huge range, but it can be temperamental. Alizarin Crimson [C14H8O4 , developed from an organic derivative of coal tar, where anthraquinone dye is converted to the calcium salt in the presence of alumina hydrate and a small percentage of sulfonated castor oil, in case you were wondering] has a bluish undertone, that if not handled carefully can get a bit muddy; especially on my palette which seems to becoming both exceedingly sparse and increasingly dangerous. Get a bit of Flake White in the Alizarin Crimson and it's Pink City, and I’m talking Barbie Doll meets Elastoplast. Cut in too much French Ultramarine and purple ensues. Given that I have a lively painting style, I can ruin the whole palette with a careless stroke. Then it’s turpentine and rags all the way. Cow piss, that’s the truth about Indian Yellow. But before you run eagerly to the local dairy herd, it’s not just any cow piss. Indian Yellow is an obsolete lake of euxanthic acid, for those of you cognizant of these things, which is produced by heating the urine of cows fed on mango leaves [I kid you not]. As the urine evaporates, bright yellow crystals are formed. I suggest you don’t try this at home, due to the scarcity of mango leaves if nothing else. Just pop down to your local colourist and get him to put you some up in a bladder or two. Sometimes it's hard to know why I paint and draw. When you’ve been doing it for a long time you know what to look for. I’ve been drawing in charcoal for long time, I’ve been drawing for even longer. 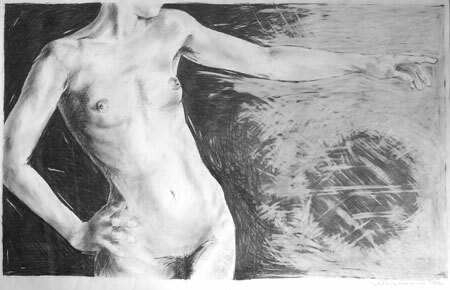 I started drawing, seriously, in graphite, over twenty years ago. I would get huge pieces of paper that I would cover in the lead compound from one side to the other. And that took some doing I can tell you. 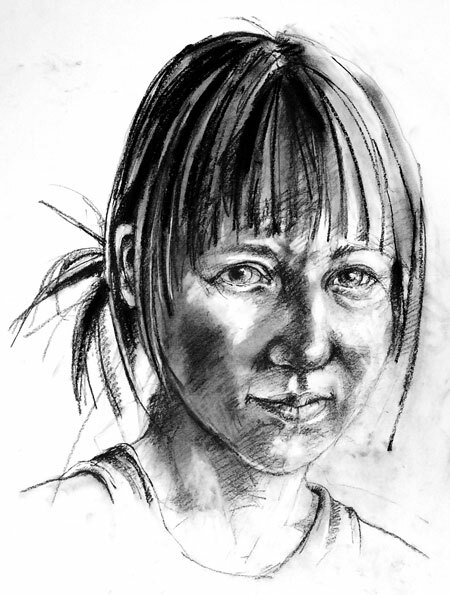 The graphite was a hard, unforgiving, substance and charcoal is much more malleable. Graphite takes an age to get into the black. Charcoal beats the pants off the new Aston Martin, it goes from zero to black in half a second. Mind you once you’ve got the dark of the blackest black down there ain’t no going back. I’ve been doing it for so long I’m beginning to know what to look for, I know the features that suggest the form. I know where the Iliac Crest is, what subtle curve is produced by Richer’s band and the way the Satorious wraps over the Vastus Lateralis, and the implications of the beautiful Adductor Longus. 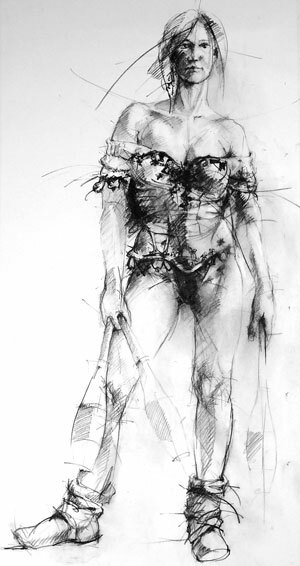 That is, knowing what goes on underneath enables me to put down the marks which suggest the form. 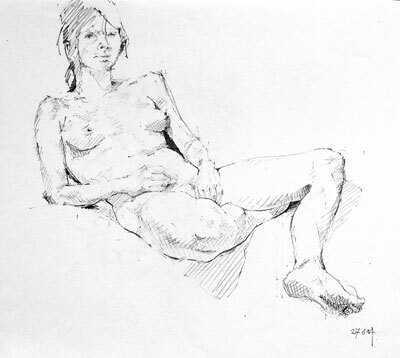 I look at the figure and make myself see the slight indentations and variations on the surface that I know are there. Time was the Art Academies would have students drawing skeletons for months on end. Then they would move on to the Ecorché – literally: flayed. This was a model of the body with no surface tissue, showing all the muscles. Then they would spend months drawing drapery before they were allowed near a life model, who was Old Harry from the Porters Lodge nine times out of ten.